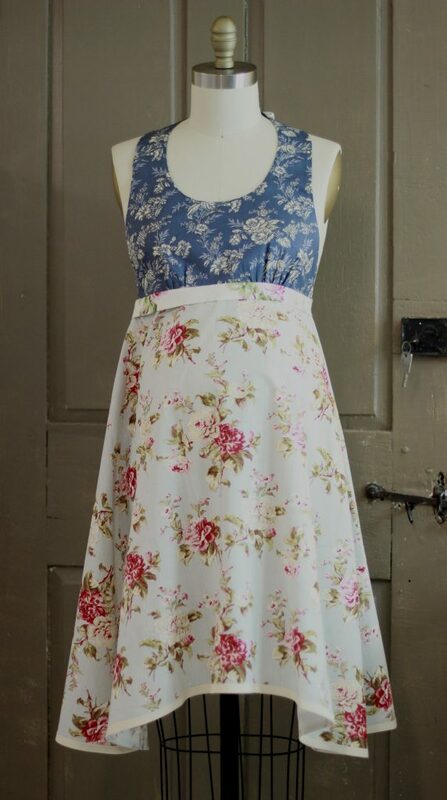 Customers request maternity aprons. Although we have not been selling anything specific to maternity, we often recommend that the customer purchase a No Tie Apron as we make the assumption that its roomy design will flatter and fit throughout pregnancy. Like I said, we make the assumption. We are unable to conclude anything even after years of advice as no one has ever written back to say “Hey you were wrong, it doesn’t fit.”. We pressed onward, still offering maternity apron suggestions with nothing to back it up except the omission of negative feedback. We decided it was time to back it up. As we had no customer feedback, we decided to do our own tests. 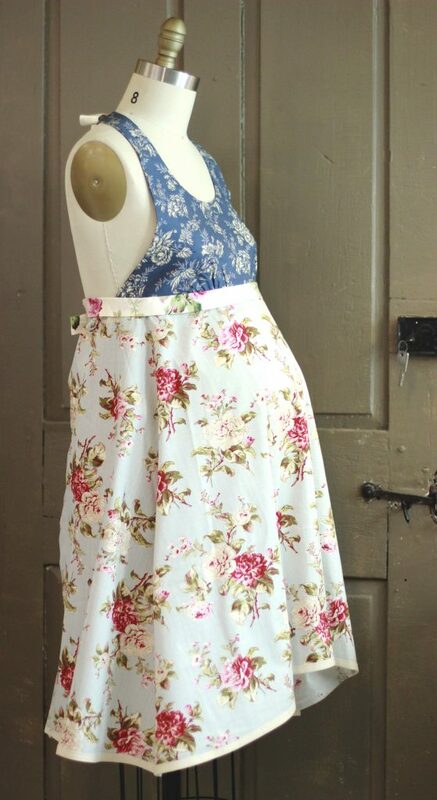 Purposefully adding maternity aprons to our agenda this year, we purchased a belly bump for our dress form. It didn’t cost too much and we know this will be an ongoing area of design, so it was good to acquire a proper fake belly instead of bunching stuffing in assorted ways that never look like the real thing. It seemed appropriate to purchase an official belly bump pad. I have seen maternity mannequins but quite frankly that limits us to that one size of the mannequin. 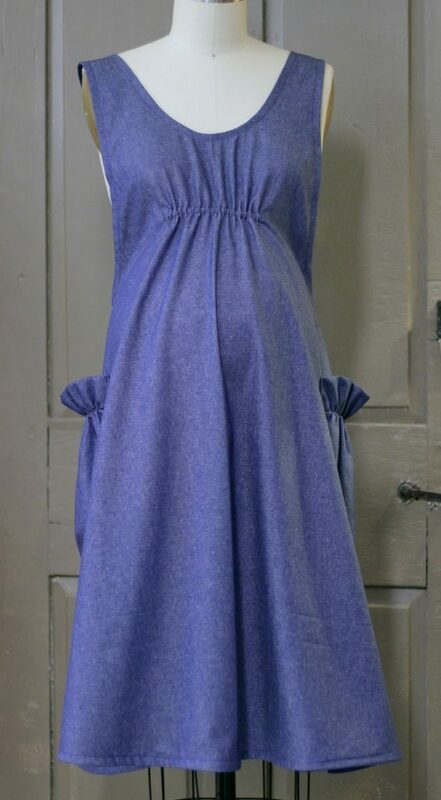 A belly bump can be attached to any dress form, no matter the size. All of our dress forms could now become pregnant. And actually, so could our models. We were excited to get to work. Without an actual maternity design, without knowing what customers might need, we started at the beginning. 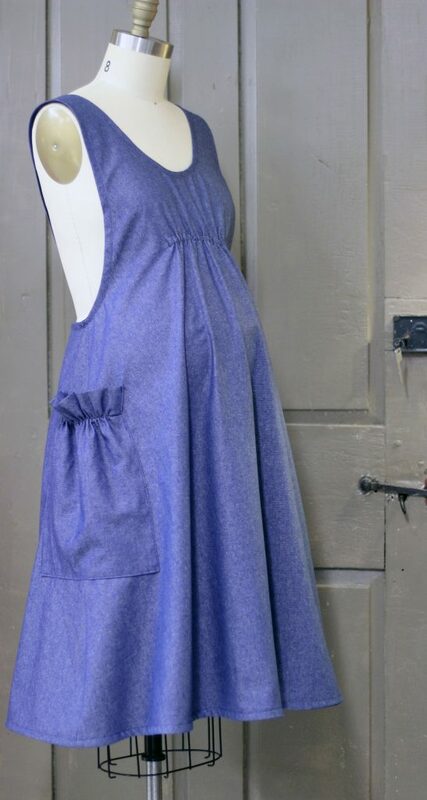 We put the belly bump on our size 8 dress form as we have our apron samples hanging around in all of our various styles. We began and tried each style over the belly bump. We wanted to identify which of our designs were already suitable for maternity wear. No Ties Aprons were really good at identifying themselves as a maternity apron. The back panels even met in the back. Even though this was a standard size belly bump, we could see that if you were larger than this, (my goodness I was), the back panels still allowed for additional room. So we were good. The No Tie Apron was proclaimed maternity-able. The Scrap apron design also wore really well. It’s a more fitted look. But then that simply offers the customer a variety in styles. Some of you love roomy, flouncy space in your clothes. Others prefer a refined tailored look. 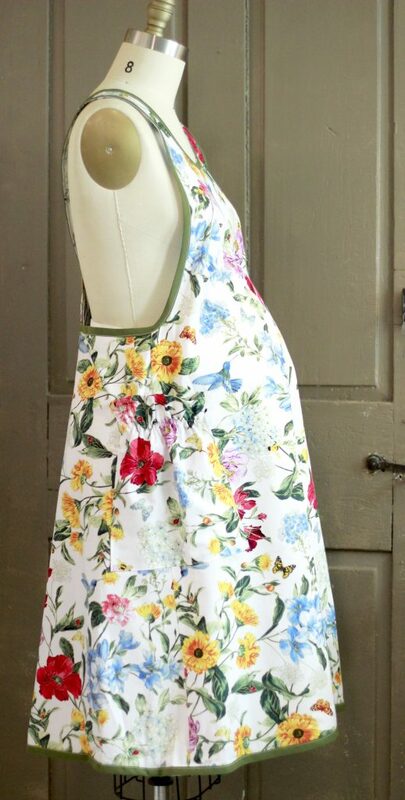 The Scrap Apron done in a linen would fill that need. I don’t like the Hippy Apron for maternity aprons. I would have thought it would be brilliant. After all it fits under the bust and hangs in biased draping. How could it not be incredible? It is not incredible. I was incredibly wrong. The Hippy apron is technically specific in how it drapes around the body. 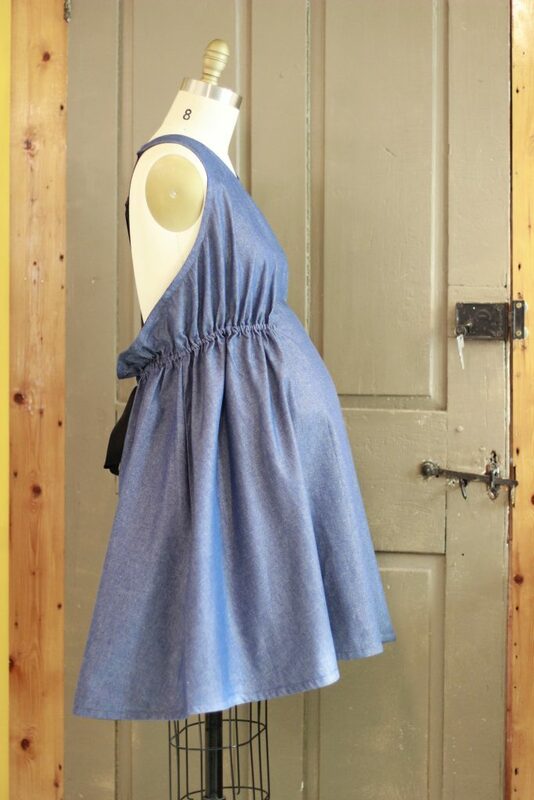 It was created by draping on a mannequin….not a pregnant mannequin. This draping doesn’t work as nicely on the pregnant figure. Although it “fits”, the overall look is a bit awkward. At least to me, I am providing photos so you all can decide for yourselves. After all, we are here for you. If you all think it’s great, we are going to sell it to you! The Aline Apron works in that it fits. But I think it looks better if you shorten the adjustable back straps and allow the elastic waist to sit higher. This design does have adjustable straps so you can play with the look. 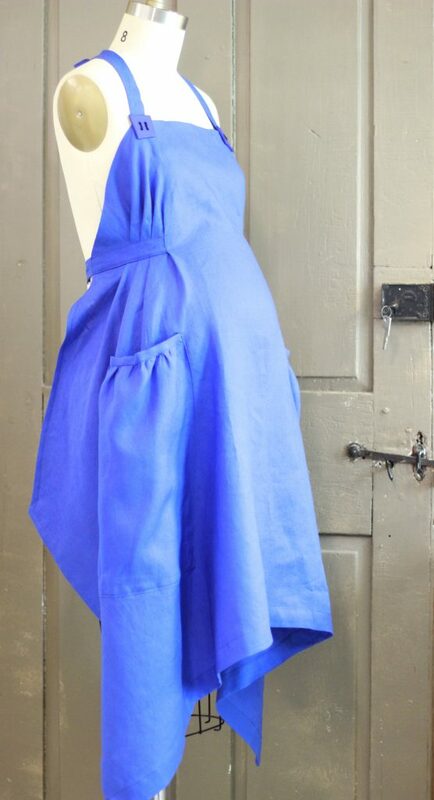 As it also has the elastic waist, the apron isn’t going to move around on you. It’s going to stay in place and keep up with your moving body instead of flowing around you. Again, I think this offers another choice depending on customer preference. 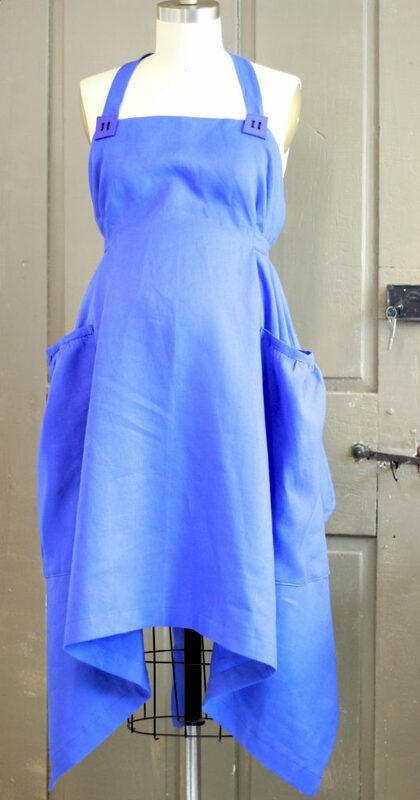 What we will do is create a collection entitled Maternity Aprons. 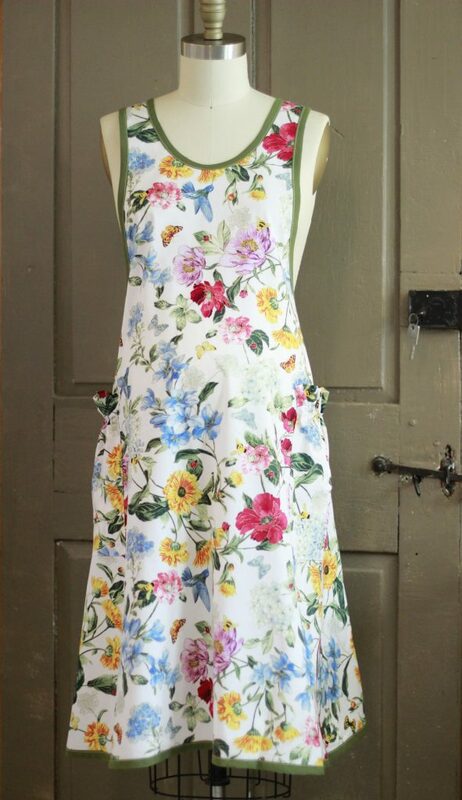 Any of these aprons that we deem comparable to pregnancy, we will add them to that page. And specific to that page, we will start with our new design. Our Maternity Apron #1. 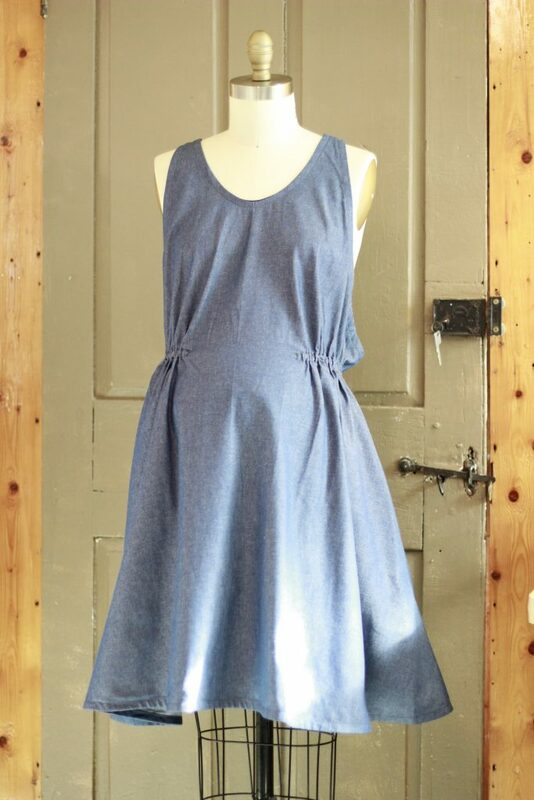 Maternity Apron #1 began its design from our most popular apron, the denim No Tie Apron. We added width to the front piece. We added an elastic casing under the bust. 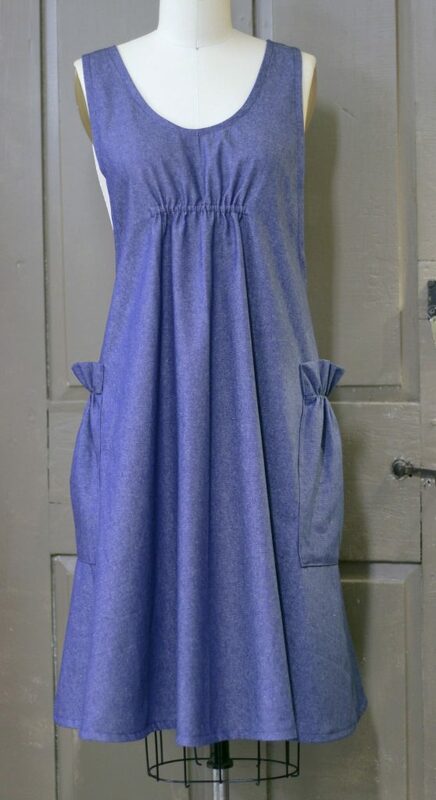 And we moved the pockets just a bit back so they sit directly over the side seam. It has enough fullness to cover the belly, it also hangs nicely without the belly pad. And the back panels meet so should the customer need more room, the back panels will separate and allow almost another foot of width if needed. And can I state that again? It looks nice without the belly pad! (Well, that was an accidental design.) Sometimes design surprises us. Sometimes designs are born unexpectedly on the cutting table or on the dress form. Let us know what you think because it’s all about you! Beautiful and very thoughtful. You may need to lower the front elastic. Remember, the bustline also grows during pregnancy, raising where the elastic would fit in late pregnancy.